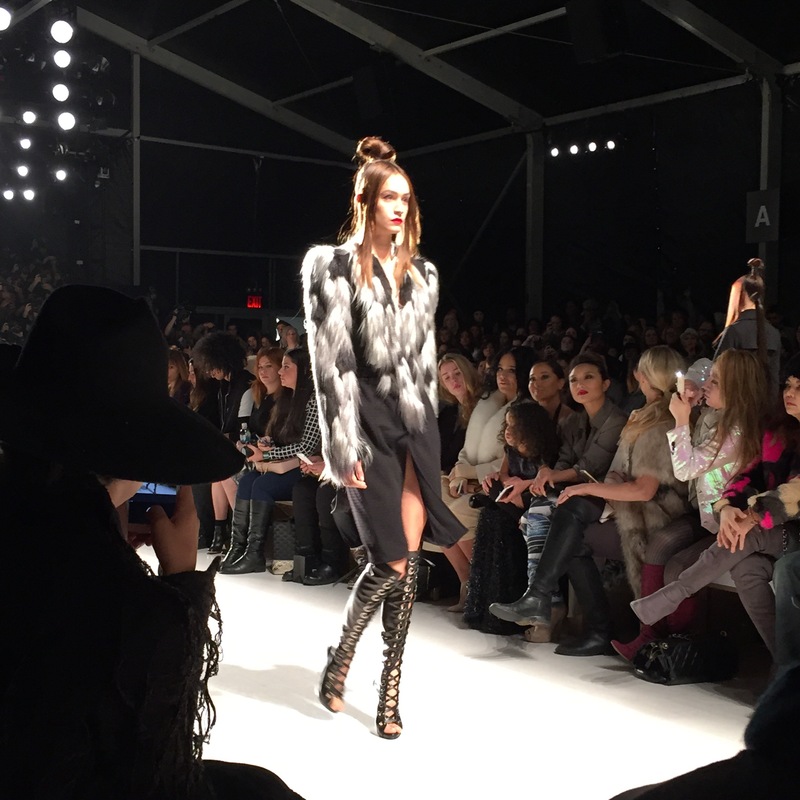 Second day at Mercedes Benz New York Fashion week and today is a cold day. I woke up and it was snowing! Not crazy snowing though, there was just a nice blanket of white on the ledge and down below from my hotel room. Today’s adventure consisted of me taking the subway by myself. My friend Marissa had taken me on it yesterday and told me it was a quick stop to the Lincoln Center and it was! When I walked outside it wasn’t as bad as I had imagined and quickly started getting warmed up as I walked a couple blocks to the subway entrance. 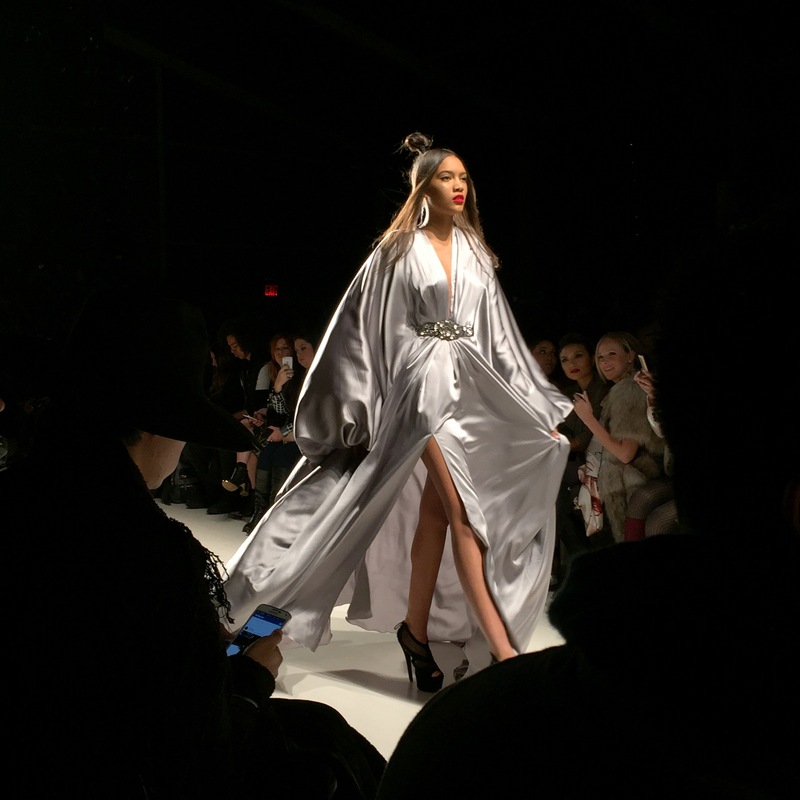 When I arrived it was a short 2 minute walk upstairs to arrive at the MBFW building and take my seat at the Michael Costello show. The lights dimmed and the show began with a Nicki Minaj song and various black lace outfits emerged from backstage. A little to the front and side was Adrienne Bailon and apparently Christina Milian and Chris Brown were there but I didn’t catch a glimpse of them. Some of my favorite looks had black and white fur coats on and the black cut out gowns were impressive. While I did expect a bit more, I had a handful of looks that I would consider wearing…if I ever had an extreme, bougie event to go to hahaha. The E! stage was set up after the show where a couple of the hosts were talking to Michael and then Joan Smalls walks right on up and looks absolutely stunning. I ate and waited around a bit until I finally had to bounce back. I headed back to the hotel, via subway ;), and worked on a couple stories before I headed back to the Lincoln Center only to find out they had overbooked the Lupe Gajardo show and couldn’t get in. Bummer! So naturally I started freezing and needed to get back to my hotel around 9:45pm and grabbed dinner. I swear I’m still on West Coast time and should be asleep but it’s like 7 back home. Tomorrow’s adventures include one last show and a phoner with Custo Barcelona! As for now I’m just Livin La Vida Liz and ready to go to bed!